We all know that trees are generous givers. They eliminate carbon dioxide, provide a home for little critters, and offer us shade. However, there seems to be one last untapped resource: trees can also produce small amounts of electricity. And now researchers at MIT have begun to develop a way to harness that power so trees can finally do something for themselves: track climate changes that will help minimize damage from forest fires. For some time, the US Forest Service has regularly tracked and predicted forest fires with over 2,000 automated weather stations in forests around the US. These weather stations track climate data, such as humidity and temperature, which is used in fire prediction models to forecast fire activity and help fire fighters suppress fires quickly. Up until now though, these weather stations have been battery operated and sparsely located throughout forests, making it costly to replace batteries and hard to collect enough data. Scientists have known for some time that trees produce a small amount of electricity. After a lot of research and debunked theories on how it happens, researchers from MIT’s Center for Biomedical Engineering (CBE) have discovered that trees produce electricity due to a fairly simple phenomenon. 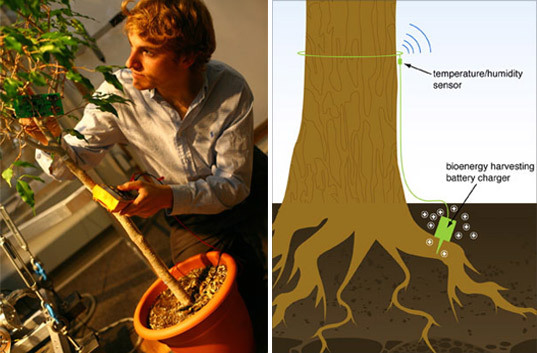 An imbalance in pH between the tree and the soil creates an electrical charge, which can be used to power very small devices. Although trees do not produce a lot of energy, with a trickle charge, the tree’s own electricity can power a weather station the size of a pack of gum- and give scientists and fire fighters enough real-time information to provide early warning alerts of forest fires. Additionally, the bio-energy power module gathers the electricity from the tree without harming it, and will last as long as the tree is alive. Huh, that's interesting. I can't wait to read more on this when more tests are done. If it's viable, maybe we can stop cutting so many trees down.